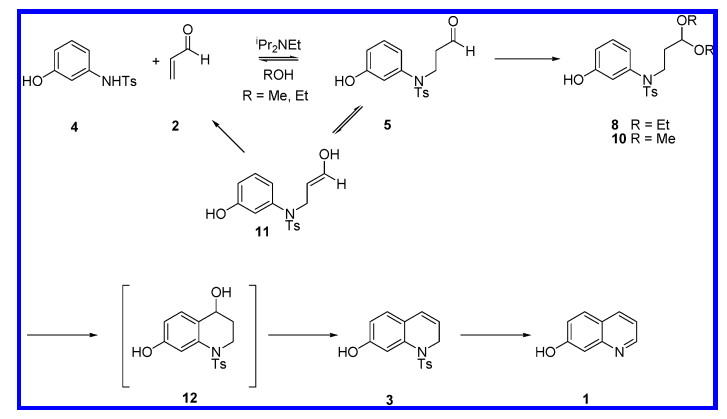 ◆The synthesis of 7-hydroxyquinoline 1 involved the Michael addition between 4 and 2. Acrolein 2 is vulnerable to polymerization under reaction conditions (Et3N/MeOH, 0°C). As a result, the synthesis required a large excess of highly toxic acrolein and a chromatographic purification was necessary to remove N-tosyl-5-hydroxyhydroquinoline regioisomer and polymeric impurities. ◆The polymerization issue could be mitigated by conducting the reaction at a lower temperature. ◆The first Michael reaction of 3-N-tosylaminophenol 4 with 2 was conducted at −5°C in ethanol. This lower reaction temperature greatly limited the formation of polymeric materials, which made the subsequent workup much easier. ◆In addition, in order to solubilize polymeric materials that otherwise adhere to the precipitated product, a small volume of toluene was added to the reaction mixture prior to pH adjustment. ◆Subsequently, the workup with water created a very large exotherm and resulted in unacceptably high process volumes. ◆The polymerization of 17 was minimized by adding chloroketone 16 to a preheated sulfuric acid at 90°C at a rate comparable to the cyclization rate of enone 17. 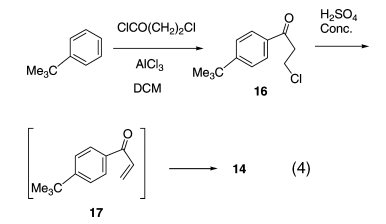 With such modified reaction conditions, the reaction was conducted at higher concentrations (0.7 M), and the polymerization of 17 was minimized.